Generally, you need three ingredients for stagflation: high unemployment, high inflation, and slow (or slowing) economic growth. We currently have, or are nearing, all three of these criteria. And the U.S. has been here before, with stagflation dominating the economy from 1973 to (at least) 1979. But this time, the underlying circumstances are different. Economic growth since the last major recession has been slow, steady, and consistent. Since March of 2009, the S&P 500 has gained 302%. Not bad, if there were no other factors working against it. The optimists would like you to think the economic growth party is going to keep going. But here in the real world, an inflation rate of 2.6% is already priced in by 2019 – then the market is going sideways. This real world scenario is unprecedented, and by 2020 looks to force a reckoning of sorts the U.S. has no monetary policy for. Rates will rise two more times this year, and if Chairman Powell has his way, it’s possible for rates to rise an unprecedented eight more times in 2019. No matter how you cut it, it looks like the slow growth ride is over. Inflation measured by the CPI (Consumer Price Index) is on the rise, clocking in at +2.9% on “all items” as of the current release from the U.S. Bureau of Labor and Statistics. But we know the “real” inflation rate, which factors more real costs in (e.g. healthcare), is much higher. So, much like sweeping yield curves under the rug, the Fed has seen data that skewed its version of economic reality. So it’s reporting a different reality. And it seems that same disconnect applies to unemployment, too. We’ve already shown that the real inflation rate is likely much higher than the standard rate reported by the U.S. Government. But what about the unemployment rate? The current rate is 4% and rising, according to the Bureau of Labor and Statistics. But that only factors in the people who are in the labor force and have looked for a job within the last 4 weeks (called the U-3). Once they aren’t in the labor force any longer, they aren’t reported in the statistics. Which leads us to ask, what is the real unemployment rate? How many people who could work are unemployed (or marginally employed) in the U.S. right now? The Fed doesn’t like to report this unemployment number, which is on the rise. So the U.S. may have created 280,000+ jobs recently, but three times that many people “dropped out” of the statistics. When the Fed (and the mainstream media) report “the lowest unemployment rate” in years, they simply aren’t including everybody. And if you start factoring in long-term discouraged workers, something the U-6 doesn’t even include, the actual unemployment rate could be as high as 21.5%. As you can see, the unemployment rate has a “shadow rate” just like inflation does. So slow economic growth? Check. 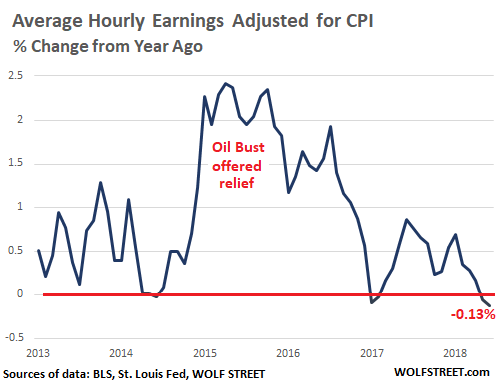 Rising inflation? You bet. Potentially high unemployment? The Fed won’t tell us. Stagflation is certainly in the cards for the first time since the mid 70’s. Who is Going to Pay for the Specter of Stagflation? Even if all roads are leading toward stagflation, like adding a weakening dollar to the equation, who is going to foot the bill? The short answer? Consumers, renters, and buyers. The nominal wage-increase of 2.74% was more than eaten up by inflation as measured by CPI of 2.87%: Real wages fell by 0.13% from a year ago. Workers pay for consumer price inflation. Keep in mind this is the standard inflation rate being adjusted. If real inflation was widely reported, the resulting panic might disrupt the entire market. The Fed knows this, and reports the standard rate instead. 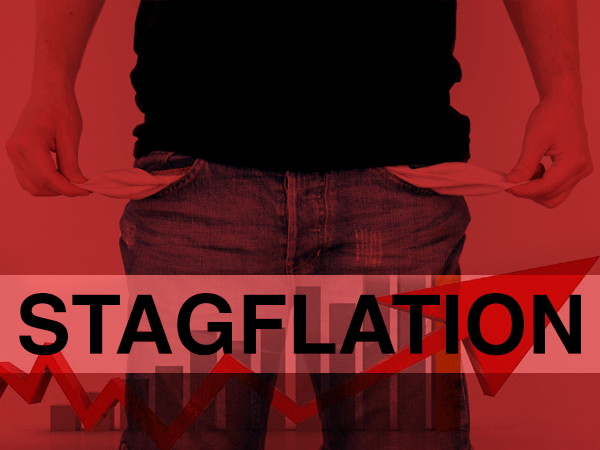 Stagflation could be looming right around the corner.